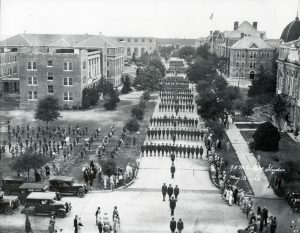 This cherished A&M tradition has been previously designated Mother’s Day, Mother and Dad’s Day, Parent Appreciation, Open House, and Parents’ Weekend. Presently, it is called Family Weekend (see our name change announcement tab). While the Maroon and White football game is now a much anticipated Family Weekend event, the game first appeared on the schedule only as recently as 1982. This exhibition game began as a charity event in 1941 and, over the decades, involved intramural student athletes, former varsity players, including Heisman winner John David Crow, and current Aggie players and coaches. Under the supervision of New Student & Family Programs, Family Weekend is planned and coordinated by the Aggie Family Ambassadors student organization. This special time is dedicated to Aggie parents and family, and gives Aggie students a chance to express their gratitude to those who have impacted their lives.